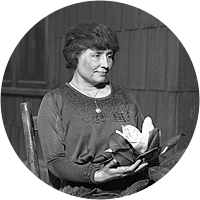 A collection of the best Helen Keller quotations. Life is either a daring adventure, or it is nothing. We can do anything we want to do, if we stick to it long enough. There is plenty of courage among us for the abstract but not for the concrete. The most pathetic man in the world is someone who has sight, but has no vision. The simplest way to be happy is to do good. This is instant and infallible happiness. It is not possible for civilization to flow backwards while there is youth in the world. I regard philanthropy as a tragic apology for wrong conditions under which human beings live. It gives me a deep comforting sense that Things seen are temporal and things unseen are eternal. The most beautiful things in the world can not be seen or even touched. They must be felt with the heart. The best and most beautiful things in world can not be seen or even touched. They must be felt with heart. When we do the best that we can, we never know what miracle is wrought in our life or in the life of another. The best and most beautiful things in the world cannot be seen, nor heard, nor touched . . . but are felt in the heart. Science may have found a cure for most evils; but it has found no remedy for the worst of them all — the apathy of human beings. All true service is God's service, when we do the best we can. We never know what miracle is wrought in our own life or the life of another. There are no such things as divine, immutable or inalienable rights. Rights are things we get when we are strong enough to make good our claim to them. Many men have the wrong idea about what constitutes true happiness. It is not attained through self-gratification but through fidelity to a worthy purpose. Many persons have a wrong idea of what constitutes true happiness. It is not attained through self-gratification but through fidelity to a worthy purpose. I look upon the whole world as my fatherland, and every war has to me a horror of a family feud. I look upon true patriotism as the brotherhood of man and the service of all to all. Character cannot be developed in ease and quiet. Only through experience of trial and suffering can the soul be strengthened, vision cleared, ambition inspired, and success achieved. I believe that life is given us so we may grow in love, and I believe that God is in me as the sun is in the color and fragrance of a flower – the Light in my darkness, the Voice in my silence. Many persons have a wrong idea of what constitutes true happiness. It is not attained through self-gratification but through fidelity to a worthy purpose. Happiness should be a means of accomplishment, like health, not an end in itself.